We’re reading the book of Tobit at Evening Prayer this week. It is one of the Bible’s novellas, weaving the lives of improbable characters together in unusual ways. It often produces a smile while delivering some spiritual nourishment. 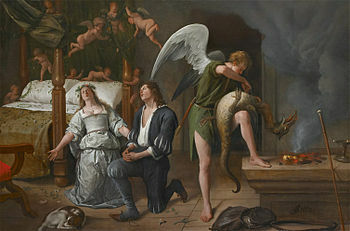 Raguel has seen seven bridegrooms suddenly die just after their wedding to his daughter Sarah. When Tobias wants to marry her – knowing the history – Raguel agrees. But, certain of the outcome, he starts to dig Tobias’ grave as soon as they go to bed. Raguel’s actions make sense. It’s human to protect our hearts, to expect little to avoid great disappointment. Especially in the midst of difficulties, we relinquish the hope of surprising joy to stave off the risk of sorrow and pain. When Raguel peeked into the bedroom and saw that Tobias had survived, he filled the grave back up before breakfast. Do you have a grave in your life that needs to be filled?